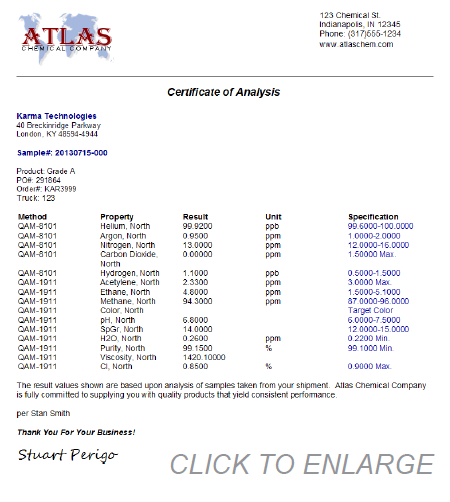 Certificates of Analysis management is an integral part of LabSoft LIMS. COAs are created using configurable templates. As many templates as needed can be maintained to provide specific product and/or customer requirements. If needed, additional security can be required for a user to create out of spec or missing test COAs. Once a COA has been created, its relationship to the sample/test results and specifications is carried forward for future viewing. Throughout LabSoft LIMS when a module such as Results Entry or Report Studio displays a result that was used on a COA, the user can drill down on the result with a right-click and display the actual COA image. Configurable templates - Using only a few templates, create hundreds of COAs for different products. Different customers and addresses are easily managed. Embed Letterhead/Footer Images - Image formats include: Windows Bitmap (.bmp), Tagged Image Format (.tif), Windows Metafile (.wmf), Portable Network Graphics (.png), JPEG File Interchange Format (.jpg). Write to File - COAs may be converted to PDF, HTML, or RTF file format. Specification Tests Option - COAs can be driven based on a customer's test and specification requirements. Create from Results Entry - Reduces the steps required by allowing the generation of COAs directly from Results Entry. COA Accessibility - Once the COA is created, you may use a wide range of available search options to Print, Fax, E-mail, & View the COA. Out of Spec Notification - If tests are missing or Out of Spec, an alert window will appear. User Input - Add configurable "User Input" prompts to allow for additional information such as Truck/Trailer # or Carrier. Merge Information - Merge Test Description, Test Results, Specifications, Method Names, Units of Measure, and Sample Information such as Approver, Submitter, Status and "User Defined Fields" onto the COA. Spec Notes - Require the user creating a COA to view important notes specific to the product or customer. These are commonly used to inform the user of customer preferences or warnings. Retrieval Options - Samples and Test results can be retrieved in a variety of ways such as Start/Stop "Lot" (or other user defined key), Start/Stop Sample Date/Time, and Most Recent Sampling.